Monday - 16th March 2008: Veteran London actor John Hewer, best known for portraying Captain Birdseye in British TV commercials for over 30 years, dies at Brinsworth House in Twickenham, at the age of 86. Tuesday - 17th March 1984: The Boat Race is postponed after the Cambridge boat crashes into a moored barge less than an hour before the race’s scheduled start. Wednesday - 18th March 1496: Mary Tudor is born at Richmond Palace. She would become ‘queen consort of France’ due to her marriage to Louis XII. Thursday - 19th March 2005: As many as 200,000 protesters march through central London on the second anniversary of the start of the Iraq war. Friday - 20th March 1974: A gunman attempts to kidnap Princess Anne by ambushing her chauffer-driven car as she returns to Buckingham Palace from a charity event on Pall Mall. Despite shooting several people, the man fails in his kidnap attempt and is arrested. There should be a fair amount of clear skies this week, meaning that the days could feel quite Spring-like at times, but that it will be a bit chilly at night. 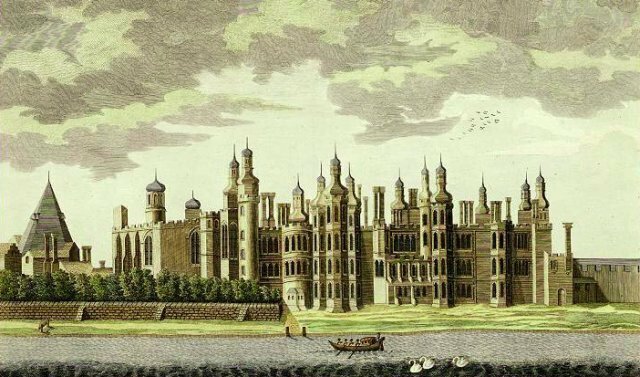 Picture taken from ‘A View of Richmond Palace’, James Basir, 1765.